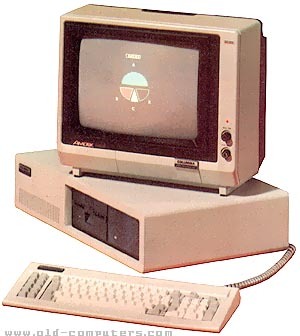 The Columbia MPC (for Multi Personal Computer) was the first exact copy of the young IBM PC. This desktop clone version will be followed few months later by a portable version designed by the new Compaq company. Technically, there is nothing to say about this computer which hardware features are exactly the same as those of the IBM 5150. However, for about $1500 less, the MPC offered standard features that were optional on the IBM: 128 KB of RAM, two Serial one parallel ports and 8 ISA slots (versus the IBM-PC's five). The MPC's disk controller was integrated into the motherboard. As IBM didn't well protect the PC hardware and BIOS software copyrights, this first clone will be followed by many others, desktops and portables version, manufactured in numerous countries by hundreds of independant companies, all over the world. The Columbia company was sold in 1986 to a company based in Florida which kept the name and still exists. see more Columbia Data Products MPC Ebay auctions !